For other uses, see Utricle. The utricle and saccule are the two otolith organs in the vertebrate inner ear. They are part of the balancing system (membranous labyrinth) in the vestibule of the bony labyrinth (small oval chamber). They use small stones and a viscous fluid to stimulate hair cells to detect motion and orientation. The utricle detects linear accelerations and head-tilts in the horizontal plane. The word utricle comes from Latin uter, meaning 'leather bag'. 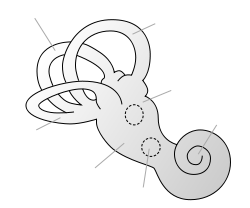 The utricle is larger than the saccule and is of an oblong form, compressed transversely, and occupies the upper and back part of the vestibule, lying in contact with the recessus ellipticus and the part below it. The macula of utricle is a thickening in the wall of the utricle where the epithelium contains vestibular hair cells that allows a person to perceive changes in latitudanal acceleration as well as effects of gravity. The gelatinous layer and the statoconia together are referred to as the otolithic membrane, where the tips of the stereocilia and kinocilium are embedded. When the head is tilted such that gravity pulls on the statoconia the gelatinous layer is pulled in the same direction also causing the sensory hairs to bend. Within the utricle is a small 2 by 3 mm patch of hair cells called the macula of utricle. The macula of utricle, which lies horizontally on the floor of the utricle, contains the hair cells. These hair cells are mechanoreceptors which consist of 40 to 70 stereocilia and only one true cilium called a kinocilium. The kinocilium is the only sensory aspect of the hair cell and is what causes hair cell polarization. The tips of these stereocilia and kinocilium are embedded in a gelatinous otolithic membrane. This membrane is weighted with calcium carbonate-protein granules called otoliths. The otolithic membrane adds weight to the tops of the hair cells and increases their inertia. The addition in weight and inertia is vital to the utricle's ability to detect linear acceleration, as described below, and to determine the orientation of the head. The macula consists of three layers. The bottom layer is made of sensory hair cells which are embedded in the bottom of a gelatinous layer. Each hair cells consists of 40 to 70 stereocilia and a kinocilium, which lies in the middle of the stereocilia and is the most important receptor. On top of this layer lie calcium carbonate crystals called statoconia or otoconia. The otoliths are relatively heavy, providing weight to the membrane as well as inertia. This allows for a greater sense of gravity and motion. Labyrinthine activity responsible for the nystagmus induced by off-vertical axis rotation arises in the otolith organs and couples to the oculomotor system through the velocity storage mechanism. That portion which is lodged in the recess forms a pouch or cul-de-sac, the floor and anterior wall of which are thickened and form the macula acustica utriculi, which receives the utricular filaments of the acoustic nerve. The cavity of the utricle communicates behind with the semicircular ducts by five orifices. The ductus utriculosaccularis comes off of the anterior wall of the utricle and opens into the ductus endolymphaticus. The utricle contains mechanoreceptors called hair cells that distinguish between degrees of tilting of the head, thanks to their apical stereocilia set-up. These are covered by otoliths which, due to gravity, pull on the stereocilia and tilt them. Depending on whether the tilt is in the direction of the kinocilium or not, the resulting hair cell polarisation is excitatory (depolarising) or inhibitory (hyperpolarisation), respectively. Any orientation of the head causes a combination of stimulation to the utricles and saccules of the two ears. The brain interprets head orientation by comparing these inputs to each other and to other input from the eyes and stretch receptors in the neck, thereby detecting whether only the head is tilted or the entire body is tipping. The inertia of the otolithic membranes is especially important in detecting linear acceleration. Suppose you are sitting in a car at a stoplight and then begin to move. The otolithic membrane of the macula utriculi briefly lags behind the rest of the tissues, bends the stereocilia backward, and stimulates the cells. When you stop at the next light, the macula stops but the otolithic membrane keeps going for a moment, bending the stereocilia forward. The hair cells convert this pattern of stimulation to nerve signals, and the brain is thus advised of changes in your linear velocity. This signal to the vestibular nerve (which takes it to the brainstem) does not adapt with time. The effect of this is that, for example, an individual lying down to sleep will continue to detect that they are lying down hours later when they awaken. Wikimedia Commons has media related to Utricle (ear). ^ Moores, Kieth L. "Essential Clinical Anatomy" Lippincott Williams & Wilkins; Second Edition (2002). ^ Johnsson, LG; Hawkins JE, Jr (Sep 22, 1967). "Otolithic membranes of the saccule and utricle in man". Science. 157 (3795): 1454–6. doi:10.1126/science.157.3795.1454. PMID 5341324. ^ Saladin, Kenneth S. (2010). Anatomy & physiology : the unity of form and function (5th ed.). Dubuque: McGraw-Hill. ISBN 0073525693. ^ Cohen, B; Suzuki, JI; Raphan, T (Oct 3, 1983). "Role of the otolith organs in generation of horizontal nystagmus: effects of selective labyrinthine lesions". Brain Research. 276 (1): 159–64. doi:10.1016/0006-8993(83)90558-9. PMID 6626994. ^ Saladin, Kenneth S. Anatomy & Physiology: the Unity of Form and Function. Dubuque: McGraw-Hill, 2010. Print.